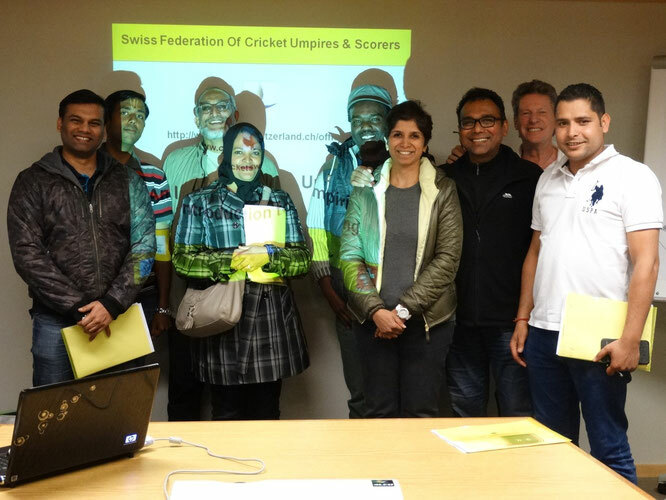 The Swiss Federation Of Cricket Umpires & Scorers (swissFOCUS) successfully ran an Introduction to Umpiring course in Geneva on Saturday 25th April 2015. Eight participants from 5 clubs took part in the course ran by Alex Mackay & Paul Cawsey, that began at 10am and concluded with a test at 4pm, all eight participants passing the course, adding another eight officials qualified to umpire in Switzerland. The course began at 10am and ended at 4pm with a 32 question test covering the material discussed in the course - including the judging of wide, no ball, lbw / run out, the scoring of runs, boundaries, umpiring equipment, scorers & signals and substitutes. Congratulations to Krishnavarahan Adhivarahan (GICC), Hemant Khamkar (GICC), Ahmed Motala (GRYCC), Fatima Jacobs (GRYCC), Nelson Burrell (Uprising), Vaishali Wankhede (Cossonay), Devendra Wankhede (Cossonay) & Pardeep Kumar (Uprising) for successfully passing the swissFOCUS introduction to umpiring course. They can expect to receive their certificates in the post in the next few weeks. For more information on this or future courses or on officiating cricket matches in Switzerland refer to the swissFOCUS officials page or contact the swissFOCUS chairman, Clive Denney.